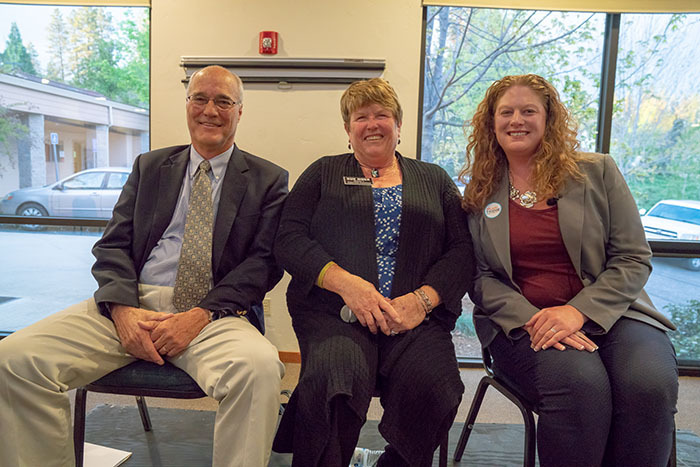 Candidates HILARY HODGE District 3, SUE HOEK District 4 and DAN MILLER District 3 participated in a debate to be elected June 5th for Nevada County Supervisor of their respective districts. Pascale Fusshoeller of Yuba Net moderated this well attended debate. HILARY HODGE is challenging incumbent Dan Miller to become a new Nevada County Supervisor representing District 3. Ms. Hodge is an issues-based candidate who is a 5th generation Northern Californian and has lived here for 10 years. Affordable housing is a priority for Ms. Hodge. She is a job creator who supports smart economic development and innovation including high speed internet which she finds critical to education, healthcare and jobs. “We need reliable affordable housing to meet the needs of our seniors and young families as well as jobs for our young so they can remain here if we hope to have a sustainable community,” she said. “We have to invest in local talent and find grants to expand local businesses and we need to provide a place for the homeless to live,” she added. She believes that it is the role of the Board of Supervisors to make the law regarding cannabis clear and concise making the Sheriff’s job to enforce the law easier. In terms of protecting children in an age of cannabis legalization, Hilary thinks that children need education about it in addition to access to alternative recreation and stimulation which must be funded. As far as people growing their own medicine, “When there is a legitimate medical need for medicinal marijuana, growing 6 plants indoors is OK as well as in designated zones outdoors,” She said. In terms of developing more diversity, she stated “….you have to give them a seat at the table to speak for themselves. We must pass nothing that affects them without them.” Concerning undocumented immigrants and ICE, she continued “I can’t support a policy that separates families without the commission of a crime. There should be a reasonable pathway to citizenship for law abiding undocumented folk. SB 54 does not interfere with law enforcement. Persons of color are under attack.” As to big box stores and youth employment, “Half of our fire fighters live out of the community because they can’t afford housing here.” “We have a lot to do. We need to be committed to a community work force as well as to small business development.” About broadband access for remote workers that has been promised for years, Ms. Hodge stated “It is common knowledge that investment in such infrastructure is essential to be competitive. We have a local internet company. AB1665 allowed the allocation of $130 million to develop it here. We have to continue to pressure for its effective development. No more excuses.” Concerning violations of the Brown Act which requires that no two supervisors talk about an issue before there is a group presentation and discussion, Ms. Hodge stated, “We have annual training not to do it. If I saw it I would go to County Counsel and report the violation.” Concerning the Sheriff’s office being sufficiently staffed, Ms. Hodge replied, “Staffing is important, we need a culture of community support as well as competitive wages. Extra staffing is much better than paying overtime.” To prepare for fire season, she said, “I experienced the Empire Mine fire and learned that evacuation preparation and access to Code Red warnings and information such as that provided by YubaNet are essential. We need to educate the public about fire prevention and recognize that our senior population needs help.” Regarding local farm production, she encourages use of farmer’s markets to purchase local produce but warned that housing for farm workers is needed. “We need to support local farmers not just for them, but for our community’s health. Unhealthy processed foods are subsidized by the government so we all need to step up and purchase healthy local produce even if it costs a little more. We need to educate the public.” Concerning encouragement of developers and builders to build low income housing, “We can start by allowing accessory building units on exiting property. Support SB831 (McKowski),“ she said. She closed by thanking us for the opportunity to speak and for our support and stated she was both honored and grateful to partake in the debate and to run for local office. In closing, Dan Miller noted that we had covered a lot here: internet, housing, cannabis, jobs, “I know the job and I have knowledge of the issues. I have served with integrity. I look for team work, partnership not accolades.” he said. SUE HOEK is a 5th generation native born in Nevada County who has lived and raised her four children here and who runs unopposed in the 4th District. She cited the need for us to come together and overcome divisions. She is committed to represent everyone. “I am here to listen,” she said. She has been active with the Farm Bureau and Agricultural Commission. Ms. Hoek supports local agriculture and resource conservation with a focus on sustainability, fire safety and forest health. She thinks we can keep the rural ambiance of our county with good planning. She supports local education of our youth in the trades as well as apprenticeship programs in order to provide the local plumbers, electricians, welders and construction workers that will soon be needed to build affordable housing. Ms. Hoek will support the Sheriff to enforce the law and compliance with the new marijuana laws. She feels that education and engagement with families and churches is the best way to protect children from the effects of marijuana legalization. However Ms. Hoek thinks that the Cannabis Alliance has done a great job and believes in medical marijuana and supports the idea of a cooperative dispensary rather than big pharma distribution of that product. In terms of issues of diversity, Hoek feels that this is a community that welcomes everyone and that we must treat people equally, including undocumented immigrants. “I support the law in California and see no need to cooperate with ICE deportations except in the case of convicted criminals,” she said. She supports local business and hopes to help streamline regulations to support small businesses here. She feels Broadband is essential and she will support the development of an infrastructure that will allow it.